I’m not sure why, but in my mind Chamonix was a place where rich people went to ski and show off. So, when I arrived I was just not prepared for the sheer wow factor of the place. I had been hired by IRun4Ultra, part of Linda Sanders’ foundation Hope So Bright, to report on the most famous ultra race of them all, the Ultra-Trail du Mont-Blanc. It is a whopping 170km with 10000m of ascent to be done all in one go. The start/finish arch is right in the centre of the town in front of an elegant white church, and under a blue sky permanently punctuated by hang gliders. The mountains are all around. High, jagged, with rich forests carpeting the sides and the glacier of Mont-Blanc gleaming white. But as the week wore on, even the staggering glory of the scenery paled before the heroism of the runners as they sprinted, danced or crawled in at the end of every race. Being back in a press centre, with rolling live deadlines was a joy. Having to become a quick expert in the biogs of previously unknown and unfancied leaders, learning how to pronounce names with too many vowels in them, chasing interviews, finding experts for comment, and of course, becoming totally addicted to the live coverage and gps feeds as the races unfolded. For the shortest race, the OCC (Orsieres-Champex-Chamonix) I got to go out on the course and follow the runners, catching up with them at various points on the route. What made it even more special was that Rachid El Morabity, the Moroccan runner who has won the Marathon Des Sables four times, was running. He’d been brought over and sponsored by Cyrille Sismondini, the race director of UTAT, and I had packed my Moroccan flag ready to cheer him on – all pretense of journalistic unbias abandoned. There is nothing to beat seeing a race unfold in real life. We caught up with the leaders at four different points. 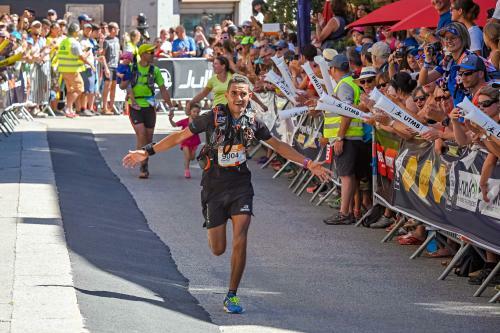 The first two had Rachid running comfortably with the leader, the favourite and the eventual winner, Xavier Thevenard, but then by the third point, Xavier had drawn four minutes ahead and you could see the stress and effort clearly on Rachid’s face. Being Press meant I got to stand right at the finish line, just behind the arch, I wasn’t a photographer/cameraman, so didn’t get to sit dead centre but I still had a fantastic view and plenty of scope to get videos and stills on my iphone and get them straight on to social media. Watching Rachid, sprint up that final 100 metres through the centre of Chamonix and under the arch in second place was unforgettable. He leapt into Cyrille’s arms and the two of them hugged and sobbed with joy. To come second in a race at UTMB, when you are a desert specialist who has only run 5 mountain races in your life? That takes some doing. He was the only African to place at the whole competition and flew the Moroccan flag proudly – yep that same one I had carefully packed in Marrakech. The other moment that stays with me was at the finish line for UTMB when the leading men came in after over 22 hours of racing. I’d watched and celebrated with the first three as they crossed the line bu then the tall figure of David Laney from the USA appeared. He ran full tilt for the arch to place fourth and as he crossed the line, he had literally nothing left and collapsed in a tangle of limbs. Tim Tollefson, his fellow USA runner gave him a moment then rushed over and lifted him up bodily. He couldn’t stand on his own, he was done . To see that total dedication and sacrifice there in front of me was very moving. These runners give everything, absolutely everything, over hours and hours and hours and miles and miles and miles, on the hardest of trails in the heat, the rain, all through the night and into the next day. It is hard to comprehend what it must cost them. The week was a whirlwind of early starts, late nights, tweeting like a demon, meeting new people from all over the world, trying and failing to meet up with a whole bunch of Facebook friends who were there for the occasion, wondering at the lustre of the ultra running beard, cursing the French press woman who completely blocked my view at one finish so she could take selfies (head almost exploded with rage), having a giggle back in the hotel room with Linda, “I want some Badasses, Alice!”, searching for Badasses and finding some, having dinner with Callum and Brent – Brent came up with the 118118 men, finally getting to hike up a mountain, wearing a leather patch over my nose to protect it, checking out estate agents as I fantasized about getting a studio in Chamonix, meeting a mouflon, trying NOT to cry at the finish line, pretending I could speak Spanish, watching the start of UTMB and being lucky enough to see Ashok and Richard as they passed and give them a shout out and a hug, eating homemade ice cream in the Italians’ apartment….. If you liked the blog, check out my book: 8000 miles across Africa by bike. For more from UTMB – IRun4Ultra – the articles are here. Sign up to get more great stories in your inbox! If you enjoy reading this, check out my books!